I was interested in this book after seeing it on an Alex Hutchinson (Sweat Science) “not a best-of-2018” list, rather the books he liked in 2018. (Sounds familiar….) It’s safe to expect a couple more from his list to appear here in the future. The subject interests me in a cursory way. Guyenet is a respected, though not uncontroversial, obesity and neuroscience researcher who subscribes to the “calories-in-calories-out” model, which has always made the most sense to me anecdotally. I say not uncontroversial because for reasons I don’t know calories in/out is not universally accepted, and as you can imagine when it comes to things like obesity, there’s a lot of yelling from the differing sides. In The Hungry Brain, Guyenet explores the many reasons why the “calories-in” part is so damn hard for a lot of people, and the socio-economic structures that don’t help very much at all. This is a good book but I think it could have been shorter. I have consistently terrible luck with race photos. I would much rather have a few decent race photos than a(nother) t-shirt or finisher’s medal. 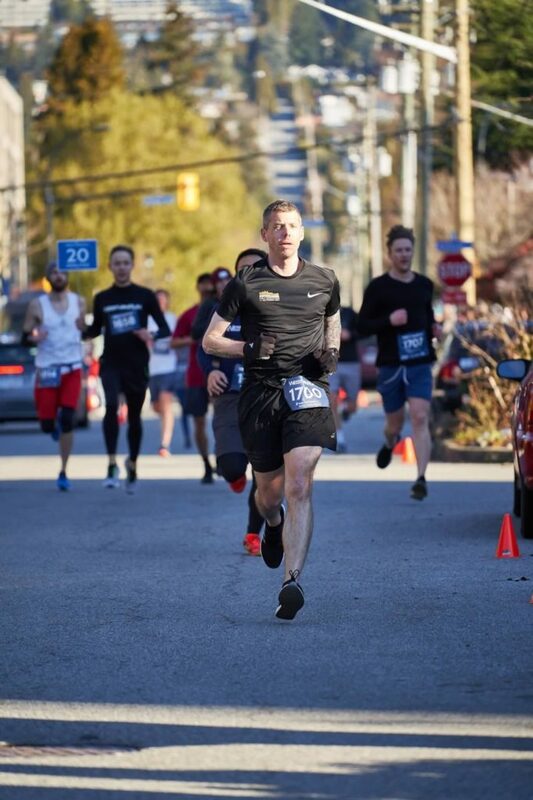 Then this year WestVanRun took like 5,000 photos over the two days and I found this one that I don’t appear to have body dysmorphia or I’m stuck behind some dude or dudette, and I kind of like it. Eight weeks until BMO Vancouver Marathon. I’m not much of a social runner but one of the resolutions I made in 2018 was to be a bit more of a social runner. It went okay. Coach proposed I join the group workouts and after a couple Wednesdays on the alternative (cycle-trainer to nowhere) I relented (self-deprecating revisionist history is fun). As luck would have it, Wednesday ended up being a wet snowstorm. I showed up exhausted mentally and physically, made it through a 3K warm up, then hit the track for 8 x 600 / 200 and to someone who knows what they’re doing that seems pretty simple but I had naddaclue. (In case you’re like me, it’s 600 metres hard (1.5 loops) then 200 metres easy (half loop) eight times.) So I did my first set not with the fastest group but the second fastest and pretty quickly realized that I’m not that fast so I joined the third for two through eight. And it went okay but I was dead by the end and while everyone was friendly and supportive I still found it a rather humbling experience. I’m looking forward to next week. For two reasons, the second being that I signed up for a bit of redemption after the WestVanRun 5K train fiasco. The St. Patrick’s Day 5K goes Saturday morning in Stanley Park and while the course isn’t quite as flat as West Van the only train anywhere nearby is the kids’ one and I’m pretty sure the course doesn’t cross those tracks. Another crack at an official sub 20:00 in a 5K race, no luck required.